This is a low-risk, high-reward move for the Niners. The 49ers may finally have their quarterback of the future. On Monday night, the Niners made a deal with the Patriots for Jimmy Garoppolo in exchange for a second-round pick, according to ESPN’s Adam Schefter. San Francisco has ridden 32-year-old journeyman Brian Hoyer to an 0-8 start with a -86 point differential that’s the worst in the NFC. Unsurprisingly, the 49ers released Hoyer pretty much immediately after making the trade, according to Schefter. The Niners are in contention for the No. 1 pick, and even if Garoppolo earns them an extra win or two, it’s unlikely they fall out of the top three, which would still give them a shot at one of this class’ top two quarterbacks — USC’s Sam Darnold and UCLA’s Josh Rosen. At one point, Darnold and Rosen seemed like slam dunk picks. But they’ve both been underwhelming in the first half of 2017. Darnold has completed 62.5 percent of his passes for 20 touchdowns and 10 interceptions with a 1-2 record against top 25 teams. Rosen sports a 63.1 completion percentage with 20 TDs — one being a fake spike to beat Texas A&M — and eight picks with his Bruins fighting for bowl eligibility at 4-4. 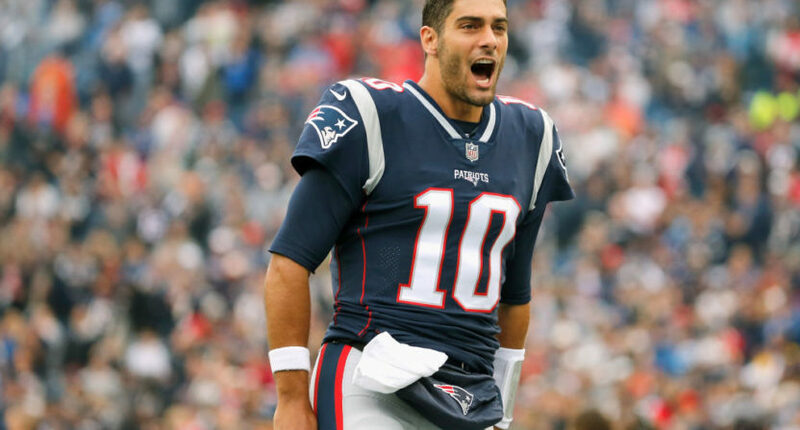 In four seasons, Garoppolo has appeared in 17 games. He’s posted a 2-0 record as a starter with 496 yards, four touchdowns and no interceptions. Now the 49ers get half a season to evaluate him as a starter in Kyle Shanahan’s system. If he lives up to the hype, they can target a different need in the draft or trade their pick to a franchise in need of a QB in exchange for a package that would far exceed the second round pick they gave up. That’s exactly what San Francisco did to the Bears in the 2017 draft. If Garoppolo is a bust, he’s is in the final year of his contract, so they can easily part ways and target Darnold or Rosen. For the price of a second round pick, San Francisco gets an extra chance, if necessary, to find a franchise QB. Even if the Patriots could have gotten more, dealing Garoppolo is still a smart move. Banking on Brady to play three to four more years, they would rather maximize the talent around their five-timer Super Bowl champion rather than keep Garoppolo on as an expensive backup. Compared to losing him in free agency, getting a second round pick in return is a win. It’s safe to say everyone walks home from this trade happy.